← Anyone for a wage price spiral? It’s budget day tomorrow, so we’re going to hear a lot of tosh. To help guide the way, I thought I’d set out some facts. It is inevitable that this will be sold as an inflation busting budget. The ALP has an interest rate problem so they will sell the budget as doing something about the economy’s inflation problem – this way, they can show that they are doing something about your looming interest rate problem (and so do something for their looming political problem). Most people won’t be able to validate this claim – I hope that this post will help a little. First of all — the most straightforward metric (the change in the fiscal balance as a % of GDP) shows that the federal government’s fiscal stance has been adding to the inflation problem – relative to the 2010/11 budget forecasts – and my personal forecast for 2011/12 suggests that the budget position will also be more stimulatory in 2011/12 than previously expected. 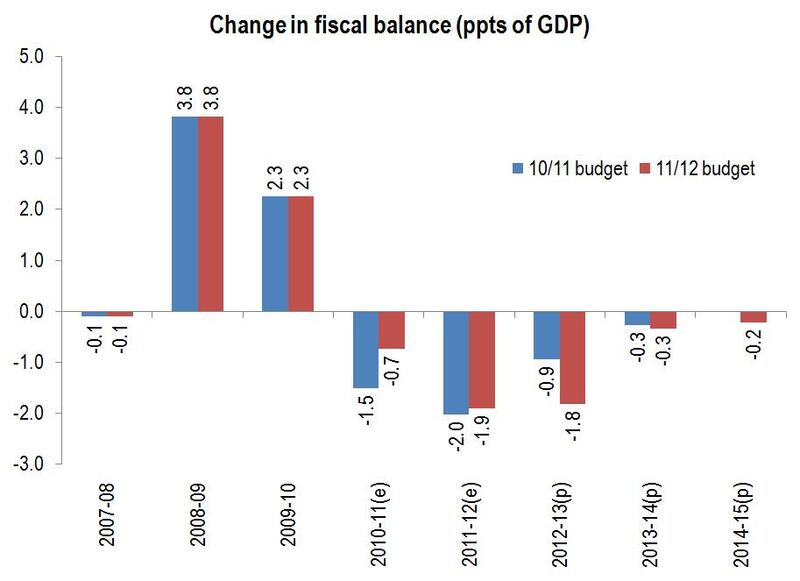 The fact that 10/11 and 11/12 are going to be so much worse means that there is much work left to do – and as a result of the assumption that they do obtain surplus in 2012/13, that’s where the fiscal contraction occurs. 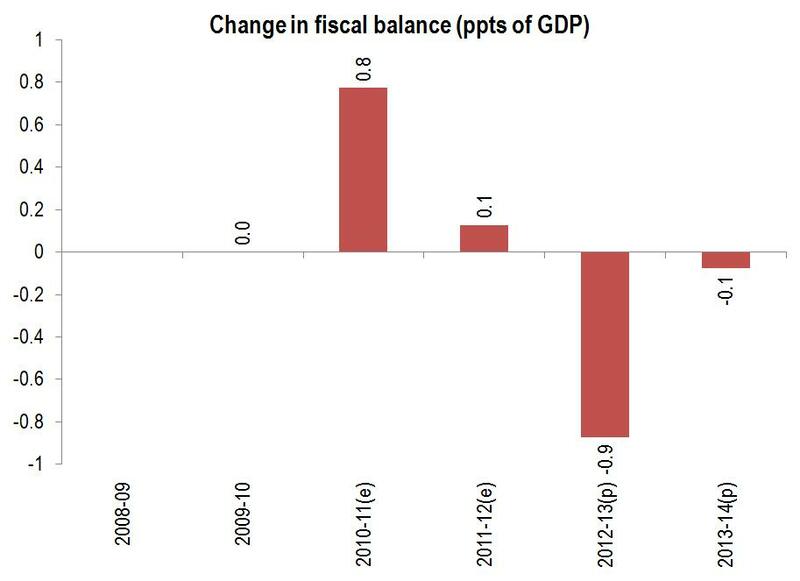 The change in the fiscal impulse between budget 2010/11 and budget 2011/12 is set out in the above chart. As you can see, the fiscal stance is more stimulatory than previously expected this year and next, and less stimulatory in 2012/13. To be clear here, the problem is not that GDP is smaller – nominal GDP is likely larger due to the higher terms of trade – it’s that unexpected weakness in tax collection has meant that fiscal drag is less than expected. Another way of saying this is that the government is not taking as much money out of the economy (because they underestimated depreciation and capital loss allowances) so ordinary folks have more money to spend. It’s like a little (accidental) tax cut! But it’s not all revenue — expenses look like coming in too high, in addition to the too low revenue. We have the monthly returns to March, and the rolling twelve month sum of expenses comes to 353bn just now, while revenue comes in at 299bn. 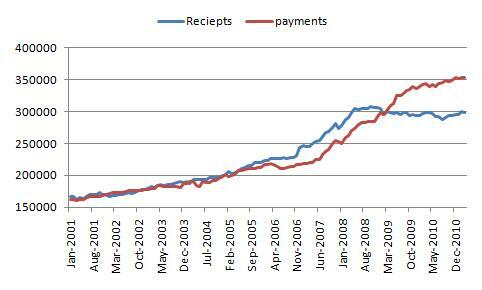 I am tipping a deficit of around 52bn in 10/11, and a little better than half that in 2011/12. 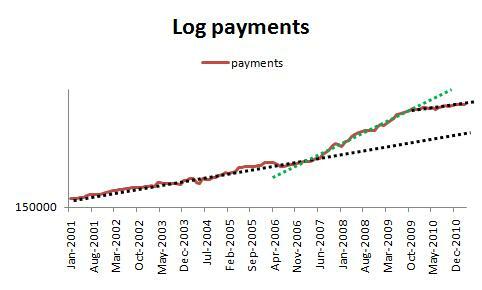 Notice that the steep uptrend in payments starts in 2007 – as PM Howard tried to spend enough to avoid losing the 2007 election – and then really accelerated in the GFC. We are now growing around the historical pace – but thus far there has been no pull back from the GFC surge in spending. So while it’s true that their budget is shot because the forecast two years of revenue growth exceeding 10% did not begin in 20010/11 as had been hoped, the structural problem is that the surge in spending during the GFC has not (yet) been temporary. The ongoing excess of spending is the reason we have a deficit right now, and the reason we’ll have one for the next few years. I only have the returns to March, and there is a little room for things to change in the final three months (typically good ones for the budget) – however I can’t see the Government putting lip-stick on this pig. The 2010/11 budget is a goner now – might as well trash it! I expect that they’ll try and dump as much spending into 2010/11 as possible, thereby boosting the expenditure baseline for the later years – when the 2% real spending cap may get uncomfortable. And, of course, Government spending causes inflation – because the government is not a price or quality sensitive buyer. Public servants care less than the average person does about value for money – as only a tiny fraction of what a public servant spends it is their own money … thus, government spending drives up prices for everyone. Actually its not a tax cut for ordinary folks, its a tax cut for mining companies. The ordinary folks, most of whom live in the slow part of the two-speed economy, are already suffering from higher-than-necessary interest rates, and those working in the non-resource tradeables sector are having their income crimped by the rampaging Aussie dollar. All of this simply serves to accelerate the transformation of the Australian economy into a quarry. And when the Chinese fixed asset investment bubble bursts what then? Quarry Australia becomes Scorched Earth Australia, because there won’t be much left here apart from holes in the ground. Contrary to popular opinion, this isn’t a wider Asian story. Its China, China, China. China now consumes 50% of the world’s iron ore and 50% of the world’s coking coal … and its not being used to manufacture widgets for Westerners, its all going into construction of infrastructure that is wildly under-used — Airports, railways, bridges, and above all, housing — all making losses, all under-utilised. We have become hopelessly leveraged to the Chinese construction bubble, and Australian policymakers are not even considering the possibility it might end. All the forecasts show unbroken growth for 20 years. I agree that there’s little that can be done, or should be done, just don’t tell me its a good thing for Australia’s long term economic future. I think you’ll find a few tourist operators in Far North Qld who might disagree with you there. The North Qld where most people live (i.e. Cairns, not Weipa) is in recession. Ric Battellino is delusional if he thinks there’s a boom (fast or otherwise) happening in FNQ. In aggregate dollar terms Qld might do ok out of this, but far more people live (and vote!) in the depressed tourist areas of FNQ, Sunshine and Gold Coasts than live in mining towns. That’s what makes this a huge political problem for whoever is in office. Eventually the voters will twig that instead of delivering prosperity, the mining boom has imposed austerity. Its little comfort knowing that Gina, Twiggy and Clive are becoming fantastically wealthy when you’re struggling to meet the monthly mortgage payment. Its also little comfort to be told that you should quit your job, sell your house by the coast, pull the kiddies out of school and move to some God-forsaken hell hole in the Pilbara to drive a mining truck. Regardless, its unlikely mining will ever employ the 500,000 currently employed in the tourism sector. You might think this is trouble for the ALP, but its Abbott who has been the chief cheerleader for the miners. I am wondering if we are underestimating the impact of a high AUD on the economy. While the rest of the world is fighting to keep their currencies low, Australia does not seem to care, because we have the commodity “boom”. – GST receipts could be down because tourist have less money to spend when visiting Australia if converted in AUD. – GST receipts could be down because Australians are traveling and purchasing from abroad etc. – Company export earning will be down. When the commodity boom ends, what are we left with? It’s not easy to turn an economy on its head, humans are not that flexible. What I find very surprising is that we have an inflation issue in Australia, that’s clear, however what is causing it is less clear. Is it credit ? not recently… is it printing too much money… not really. Why can Switzerland have very low unemployment and low inflation / rates too. I think it’s probably the high immigration levels of “relatively wealthy” people. Anyway, we have inflation, and we have a high AUD , which makes no sense, as inflation means the AUD is losing money vs. real assets. Shortly the average salary in Australia will be double the US and Europe and that amount of money can only be paid to miners. All other jobs that can be moved, will move somewhere else. If you ever find the time, and inclination, I would be interested in your thinking on why Australia seems to be in a constant battle with inflation. Is it credit expansion? Mining boom? Immigration? General exuberance? I am personally perplexed by the fact that credit growth is subdue, house price too, interest rates are mildly restrictive, AUD is very high and still we got a high CPI number in March. I am wondering if we would have got that number anyway even if interest rates were 100 bps higher. Does the RBA need to create an interest rate induced recession to control inflation? Or can inflation be controlled without killing the economic growth? We know Australia household debt is massive and interest rates do harm. On the other hand inflation is necessary to reduce that level of debt. Can you imagine having that massive household debt to repay in a deflating environment? Surely one reason for weak productivity growth is the resources boom has allowed us to sit our collective arses while China sprays ever more money at us. Australia. Fat, lazy, rich. God help us when China cracks. I believe productivity in Australia is pretty similar to other developed countries around the world, at least that would be my personal experience. Also real productivity is difficult to measure and usually it is not really measured directly but rather deduced from other parameters. For instance, during the GFC, productivity in the US went up, simply because company were producing more with less, cutting all superfluous expenses and investments. Let’s say it was “forced” productivity growth. It was deflation and recessionary conditions. In Australia, I think it’s the massive credit expansion of the last decades that has created a permanent inflationary environment: buy now because tomorrow is more expensive, take risks, increase debt, etc. Just think of the inflationary push behind policies like like Negative Gearing and CGT concession. How about house prices up 50% in 5 years? Will that change? Possibly. It has changed around the world after the GFC: excessive credit growth is not good.